The potato order is in. We went back to Alan Roman's site again this year, mainly because he is one of the few suppliers to stock Stroma which has become one of our favourite early red skinned spuds. Swift has been our first early of choice for several years. I like Epicure and would have given International Kidney a chance but Swift worked last year and success is hard to discount. Ambo, pictured above, always a favourite in heavy soils, great for all round use. So ordinary there is nothing much to say about it but it's reliable, hardy, strong growing and a good cropper. Recommended. Stroma, as I said, a favourite because it's early, comes out of the ground so clean and has good cooking qualities. Kestrel, a potato we've both loved and hated over the years. The first year we grew it, it was hard and cooked to an unpleasant texture, tasted nothing special and the plants were low yielding and weedy. When we tried it again after a few years break it grew magnificently and produced quite tasty, pretty potatoes that were virtually slug free, long keeping and fine in the kitchen. This will be a first time for them on the farm and it will be interesting to see which way they fall. British Queen which we think makes the best chips ever. It's an older variety which might not be as disease and pest resistant as more modern types but worth the effort in our opinion. Pink Fir Apple, chosen with some trepidation because it's so prone to blight. Last year, Ratte was the first to succumb and the shallow rooting tubers were nearly all lost to blight. I don't think PFA will fare any better but we love the taste and can only keep our fingers crossed. We would have bought Sarpo Mira or its close cousin Axona but they appeared to be sold out. Pity. One potato we tried last year that I wouldn't try again; Winston. 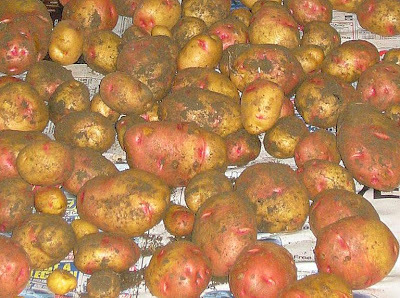 The plants were vigorous, gave a good yield despite the blight and produced nice looking potatoes that we really don't like to eat. Something in the texture is quite unpleasant and I can't find a way of cooking them in which they excel. So I was wrong to get them last year, sorry Paul. After the failure of the potato plantlets last season, faults all round but ultimately finished off by massive slug attack, I wasn't going to try for any novelties this year but Alan is offering packs of seed tubers of the heritage varieties I find most appealing, Salad Blue, Highland Burgundy Red and Shetland Black so they were added to the order as a treat. We've now got so many spuds I don't think we'll bother with the Potato Day at HDRA.